For our 30th consecutive appearance at the Showman’s Show we wanted to design a stand using our best-selling products and showcase our Frame, PVC and Linings hire stock. The Showman’s Show is the perfect opportunity to meet our customers face to face and get crucial feedback that we can use to help evolve the business going forward. The stand as a whole was made up of our 3 most popular Coverspan structures; 6m, 9m, 12m, with 3m pagodas at each corner serving as entrances. To add flair to our stand we added our signature “bake-off” style clear cones to the roofs of each structure, these became the centrepieces of the stand both inside and out. Inside, the stand was broken down into 3 distinct, but open areas, all supported using our own Flip-Flooring system straight out of our hire stock. The 9m structure hosted our range of starlight linings products in both ivory and blackout, including; blackout starlight hip-ends, a new double layered blackout dividing curtain and a 6m Ivory starlight wall. The blackout and ivory areas were broken up nicely through the use of the exposed clear cone roof in the middle. The 6m structure, this area showcased our two new types of walls; our new improved hard walling which is better in quality, security and price, and our new insulated linings, designed to provide sound reduction (up to 17dB), heat insulation to a marquee as well as combating condensation. Also in the 6m was our new stretch monty lining roofs, which provide a clean and taut peaked interior finish. 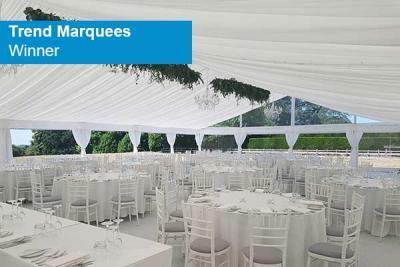 The space inside the 12m tent featured a clear cone roof, with pleated mid-ivory roof linings on both sides, capped off with matching gable infills, and queen swags. 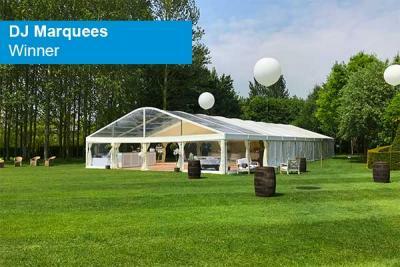 At both ends of the 12m structure was a nested display of our hire frame sizes, in both standard and curve, which was highlighted through the use of clear PVC on the surrounding walls, roofs and gables. In addition to the new products shown in the 6m, we had a Printed PVC area under the 6m cone, with two printed PVC gables and a 6m printed PVC wall, aiming to create a forestry theme. This was enhanced through the use of stretch sail shades providing shade from the clear roof, adding to the forestry illusion. Custom Covers wins first prize for their stand at the Showman’s Show 2018. 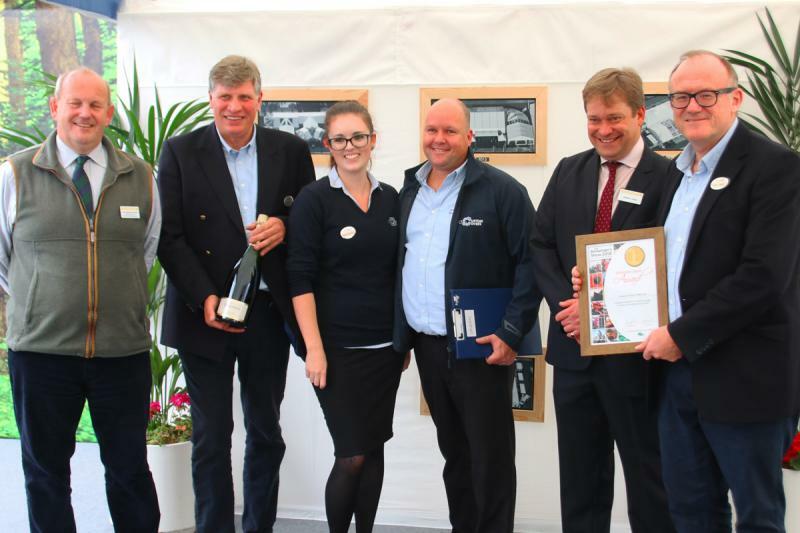 “We’re really proud to have won this award at our 30th consecutive Showman’s Show; it’s a fitting tribute to the work our team put in to designing and building the structure”. Last week we announced the winners of the 11th annual Custom Covers photo competition at the Showman's Show. Congratulations to our winners seen below picking up winners campagne, a cheque for £300 and mounted copies of the winning entry. 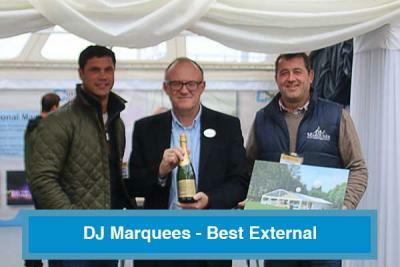 Taking first place in the external category was DJ Marquees. Here is Chris George and David Wilson pictured collecting their prizes, with their winning picture of a 9m clear curved structure. 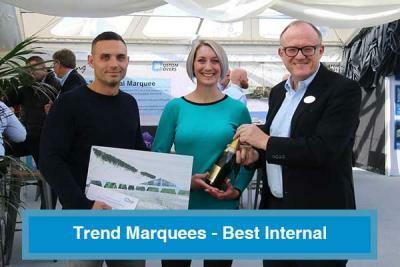 And the winner of the internal category was Trend Marquees. Here is Jamie Dawson and Shelley Smith collecting their prizes, with a photo of their winning entry. 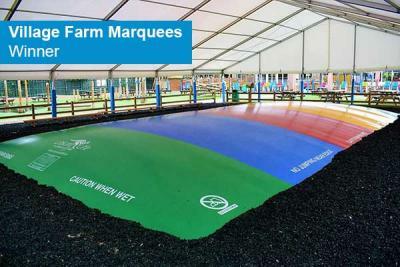 And the winner of the photo showing best different use of a Custom Covers marquee is Village Farm Marquees, for their picture featuring a giant colourful jumping bag. Check out our gallery of all the winners and runners up below.